Homepage. This page: Photos all featuring Ford E93A Prefect saloons. The "E93A" code has two meanings for anyone with an interest in "sit up and beg" era Ford cars of the 1930s, 1940s and 1950s. One, it's Ford's own identifier for the 1172cc 10HP (RAC) four-cylinder sidevalve engine that powered (!) thousands upon thousands of the firm's upright Ford 10s, either side of WW2, and well into the 1950s. Second, and relevant to the photos on this page, is that it was the model identifier for Ford's 1938-1949 Prefect model. Its replacement was the E493A Prefect, which was in effect just a facelifted version of the outgoing model. The first two photos featured here were kindly provided by Dennis Holden. 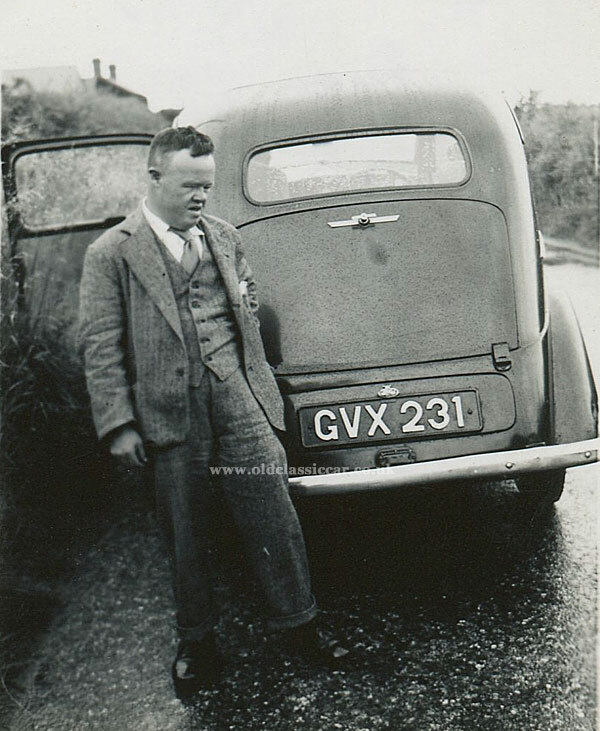 The car belonged to his parents, and he appears as a young boy in both snapshots. The first dates to about 1954. 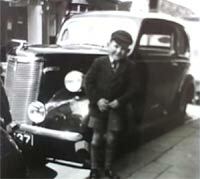 He's shown stood with his parents, and their immaculate Ford. The Prefect was available as a four-door saloon and, in a few rare instances, as a drophead coupe, or as a sports tourer. Photographs of a badly mangled E93A sports tourer can be seen on this page. 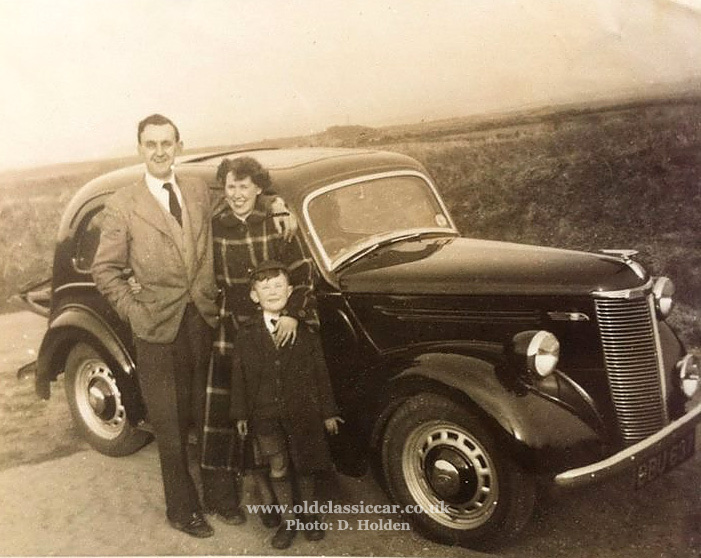 A relatively small number of two-door Prefect saloons were also built, and few survive. It was also available as a rolling chassis with front-end panels, to which coachbuilt rear bodywork could be fitted. 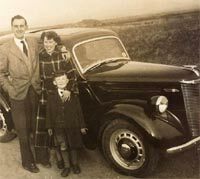 Most Prefects though were four-door saloons, many of which were painted black just like the Holden's example shown here. Theirs was registered BBU 637, an Oldham series introduced in 1938, making this quite an early example of pre-war E93A. Other identifiers that confirm its early production date include the lack of beading running around the wing edges, the badging, and the bulbous headlamp lenses. The second of Dennis' photos is a little blurred, but worth including nonetheless. 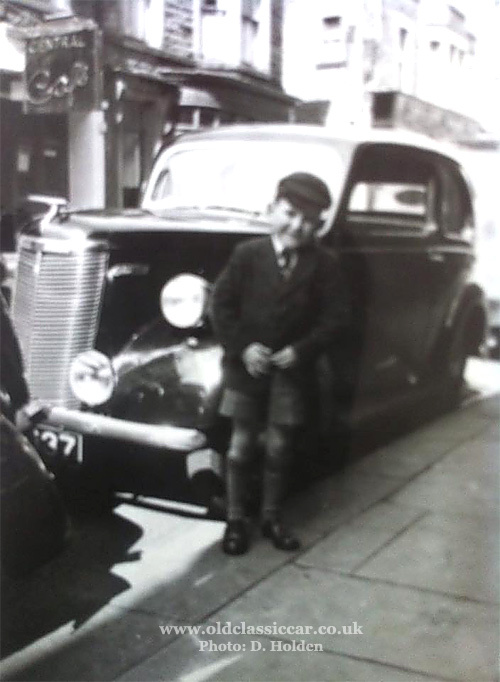 It was taken in London, outside a B&B, during a trip to the Motor Show - a long trip from their home in Morecambe, Lancashire. Note the angle of the bonnet mascot, which doubled up as the bonnet opening handle on this model. Perhaps its engine had just received a checking-over, which might explain why the mascot wasn't lined up correctly at the time of taking this picture. 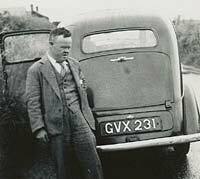 Photograph three is a rear view of a parked E93A Prefect, registration GVX 231 which is from an Essex series first used in November 1938. Clearly it was a damp old day when this photo was taken, perhaps they'd pulled over to demist the windows, or simply to let the suited chap stretch his legs - who knows?! The minimal rear lighting that was common on cars of that era is clear to see here - no flashing turn signals on the back, no tail lights on the rear wings, just a small central lamp that acted as a combined numberplate, stop & tail light. It's nice to see a proper old numberplate with cast aluminium letters, not a cheap pressed aluminium job. Return to Page 19 in the photographic archive, or visit the main index here, where you'll find many more photos of early vehicles such as this. 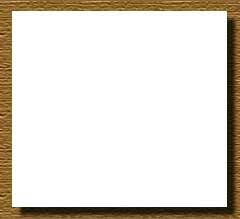 Thanks for the photos Dennis.